"Our wedding was perfect," explains Nadine Reichert about her big day with fellow German marathon swimmer Christian Reichert. "I was never more happy. The weather, the cake, the food, the speech at the church, it was just perfect." 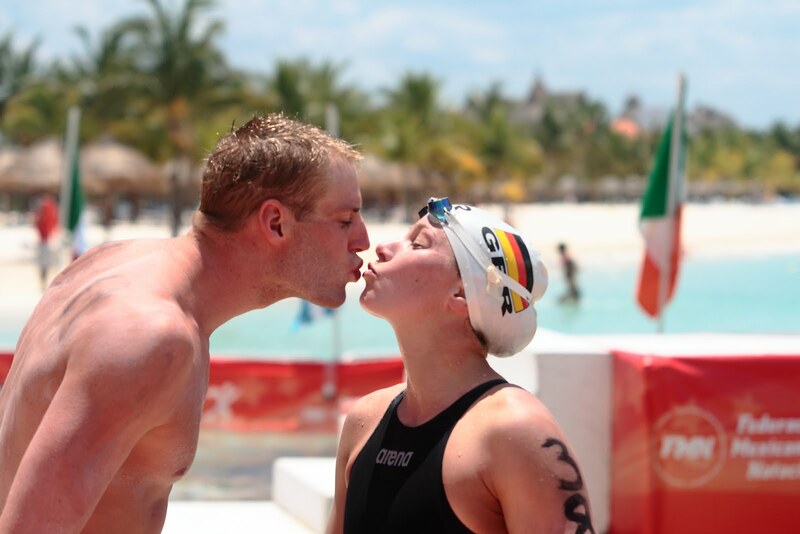 The married duo both placed second in the 2011 FINA 10K Marathon Swimming World Cup circuit. Never before had a husband-and-wife team placed so high in the open water world. The German love story started off with sparks at a German training camp in Side, Turkey. "I just knew his name but we first met in Side. I had no idea that we would eventually get married ten years ago. We were both 18 years old at the camp. He did everything to always talk with me and be around. He saw me first, but we knew at the end of the camp that we wanted to spend more time together." By the end of the training camp, the teenagers had already plotted out which weekends they would see each other and where they would rendezvous. "We lived 300 kilometers apart, but we both had our own cars and we would alternate where we would see each other. Our parents and coaches weren't happy because we were always traveling all weekend [to see each other] when we should have been resting. But I didn't listen to anyone," recalled a smiling Nadine. "Christian and I continued that weekend relationship for a year. Originally, he was a pool swimmer, but I had been to the European Open Water Swimming Championships already when we met," said Nadine who began working her magic on her suitor. "By the next summer, he started doing open water. But he tended to go out fast and then die. I moved to Würzburg and lived at his parents' house. At the time, he was completing his obligatory military duties. We both received college scholarships in the United States, but then an opportunity came up for Christian to apply for the German police force and become a Polizeikommissar. He could train and compete and receive a full salary as long as he was on the national team. It was a great opportunity that he could not pass." So the young couple took the next step and moved to a new city in 2005. "I had stopped swimming because of school and injuries, but then Christian started to have success and so much fun competing in open water. I remembered all the good times that I also had experienced in open water and I wanted to spend more time with him. So I returned to the open water world and attended my first international race in 4 years at a World Cup race in London. It was great to experience this with him." The pair participated in the 2009 World Swimming Championships in Rome and the 2010 World Open Water Swimming Championships in Roberval, Canada, both swimming the 5 km and 10 km events. "I remember being worried about my tan in Rome. Our wedding was coming up and I did not want to have white lines on my back. I put on loads and loads of sunscreen. Alexander Studzinski [another elite German open water swimmer] was our best man and my sister was my bridesmaid. But our marriage caused a problem with our visa when we traveled to compete in China. I had changed my name [to Reichert], but we had lots of trouble getting everything done for the visa on time. We still live at the same place. Christian would love to compete in the 2016 Rio Olympics. As for me, I plan from one competition to another, from one year to the next. It has been a great life over these past 10 years." With many more dreams to realize.